It’s time for my How to How I Make series. First off, kombucha tea! The first time I tried kombucha tea from a store bought bottle I shuddered. 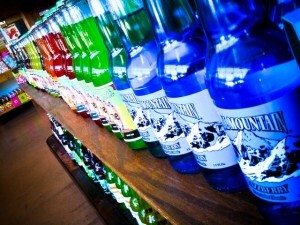 Not only was a taken aback by the taste, I couldn’t believe I was paying $2+ per bottle. Yikes! Over time, I have acquired a taste for kombucha tea and now regularly enjoy it. It helps that I make my own which I personally think tastes much better than the store bought kombucha tea I have tried and it costs pennies. Pennies! 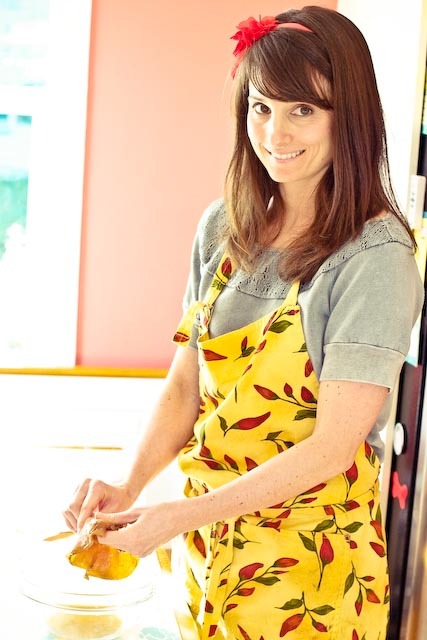 For a long time, I was too intimidated to make kombucha because it seemed “complicated”. Boy, was I wrong. (Wouldn’t be the first time.) It’s easier than making a box of macaroni and cheese and a heck of a lot healthier. When I first started brewing, the first thing I knew I had to acquire was a kombucha scoby, often referred to as a “mushroom”. 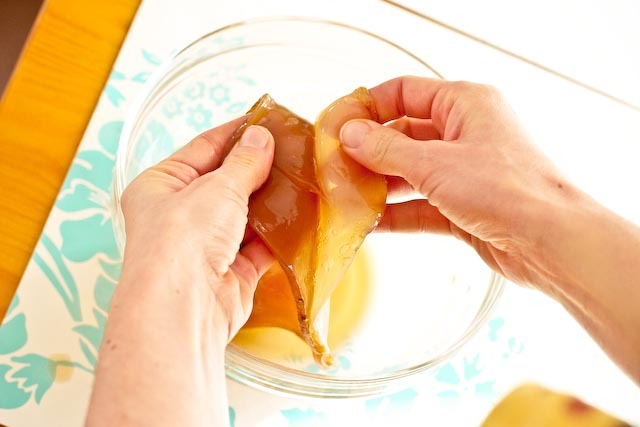 “Scoby” stands for a Symbiotic Colony Of Bacteria and Yeast. Appetizing right? Maybe that’s why some people call it a “mushroom” even though it’s not a mushroom. One of my favorite "girls". 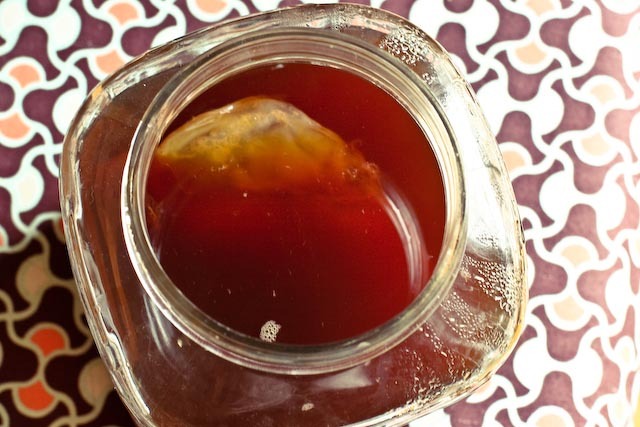 There are 3 ways to get a kombucha scoby or mushroom. 1. Buy one. There are plenty of places on the internet or look on Craigslist. 2. 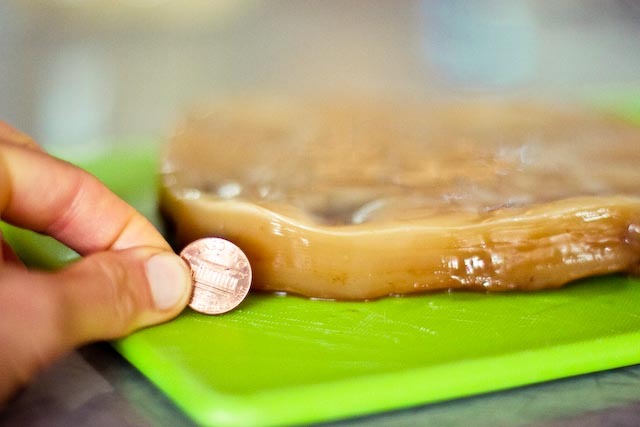 Grow your own kombucha scoby/mushroom. While I haven’t done this, supposedly, you can grow your own scoby from a bottle of store bought kombucha tea. 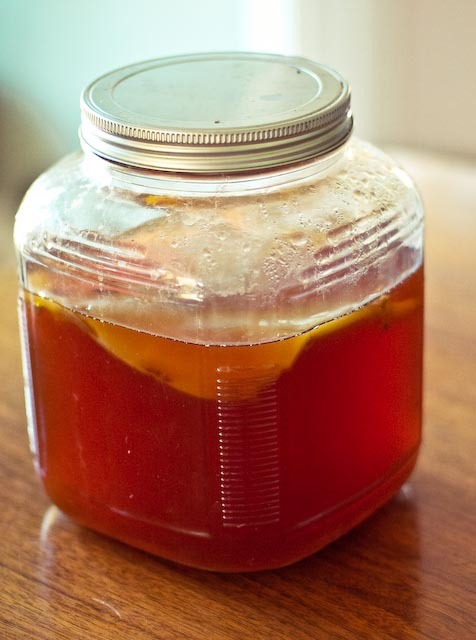 Put the kombucha in a glass jar, cover with a towel, and leave it in a warm dark place until the scoby/mushroom forms on top. When it is about 1/4″ think it is ready to use for your own kombucha tea. The time it takes to form varies. A warmer climate usually results in a quicker scoby. 3. Ask on Facebook or other social media. This is what I did and within an hour a friend from my church who I had no idea even made kombucha offered a scoby to me. Just goes to show you never know what happens behind closed doors. 😉 If a local reader ever wants one just let me know and I’m happy to pass one along. When my friend brought me the kombucha scoby she also gave me photocopied directions. I have since lost them but I have been following those basic directions for almost a year and have yet to have a batch go bad. Stir in the sugar and tea. When tea returns to room temperature (I typically just let it sit over night.) pour it into a gallon sized or larger glass container, add the scoby, and cup of kombucha. Pour kombucha into mason jar and store in the fridge. As you pour, you will notice the carbonation and if you are like me will experience and odd sense of completion and giddiness. You can separate the baby scoby from the mother by peeling them apart. Now you have two scobies and can make two batches, reunite them in one batch, give or throw one away. 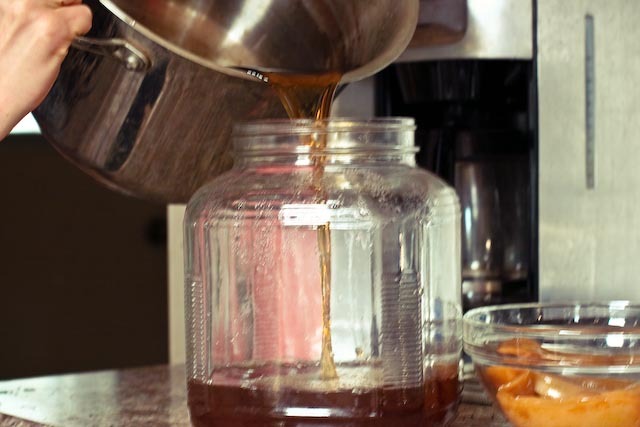 *Kombucha is the only thing I’ll use white sugar for because of the fermenting process there is not a lot of sugar left when the kombucha is ready. 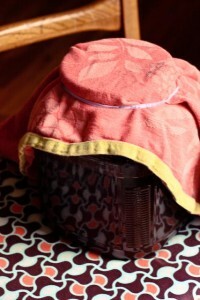 ** Despite what most directions say you can actually cover it with a lid and it will still ferment. I know this because I one day I accidentally screwed on the lid in place of the towel and got a really delicious brew. I suspect because there was less oxygen for it to ferment. I wrote Cultures for Health asking them if I could brew kombucha with a lid and they kindly wrote me back saying, “An air tight lid is fineâ€”as you discovered the kombucha will brew up nicely. The reason we donâ€™t recommend it is that during the fermentation process a considerable amount of gas builds and when you go to remove the lid, thereâ€™s a significant danger of the lid flying off and causing injury to the face. Thereâ€™s also a chance of the kombucha spraying everywhere. A towel over the lid though and downward pressure and complete control of the lid during opening can negate those issues though.” So there you go, use a lid at your own risk. I have since gone back to using towels just to be on the safe side. 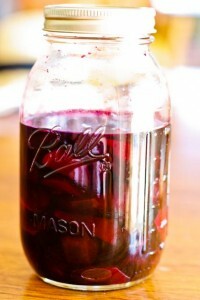 ***I’ve noticed that 5-10 days seem to be the ideal length of fermentation for me. If it’s cooler I let it ferment longer or shorter if it’s warmerl. The few times I have let it ferment 10+ days it has been too vinegary for my taste and reminds me of apple cider vinegar. A few more things to keep in mind. 1. Alway wash your hands to avoid contamination. 3. Use a clean glass container. 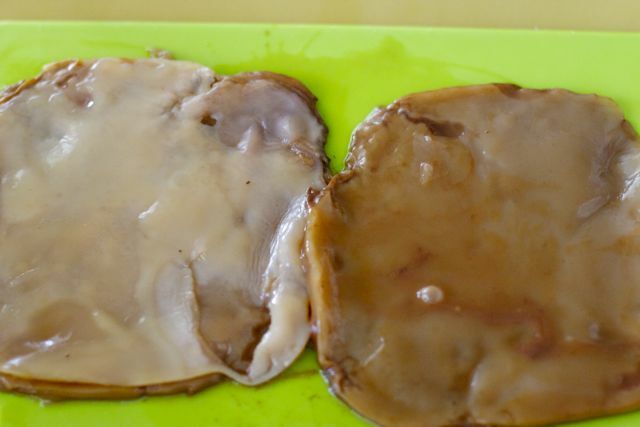 Metal and plastic can supposedly cause some problems for the scoby. 4. Some people say you shouldn’t clean the utensils with regular dishsoap and tap water. I do and haven’t had a problem. 5. Scobies can vary in appearance from batch to batch. Both of the above scobies are healthy. While I’ve never had it happen they can mold so keep an out for a funky smell or weird spots. 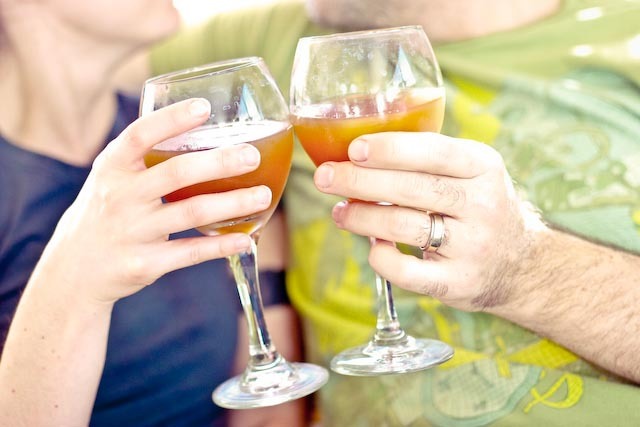 So why even drink kombucha tea? I can only speak for myself but I drink it for a few reasons variety, the health benefits, and if you serve it in a wine glass and try hard enough it can even feel romantic. As far as any sort of risk that may be associated with kombucha tea, I’m not worried about it. At all. Personally, I think I’m taking a bigger risk when I occasionally pass through a drive up window than when I pour myself a little glass of homemade kombucha. 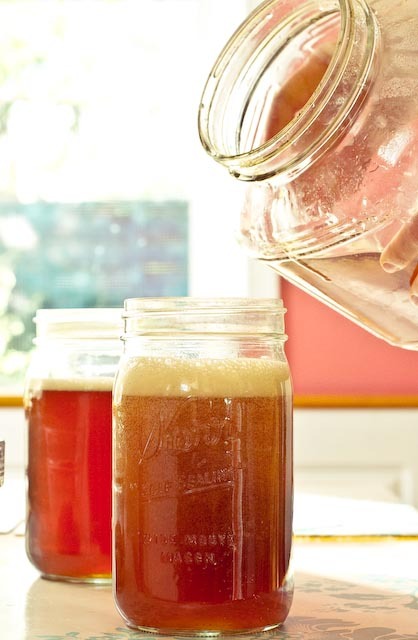 Do you drink or make kombucha tea? Any advice? Did I leave something out? 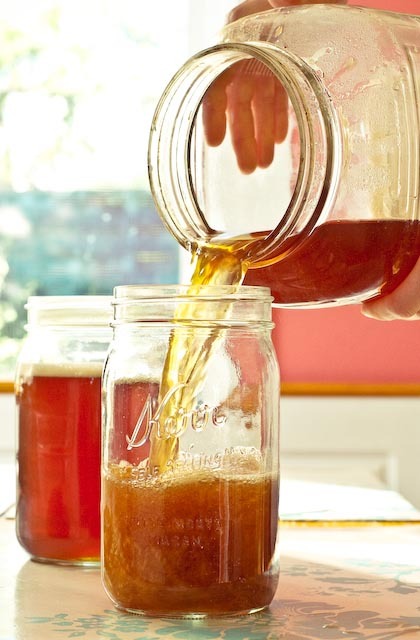 Know of any studies relating to Kombucha? If you enjoyed this post you can follow one of three ways! 1. subscribing to the RSS Feed 2. “liking” on Facebook, or 3. Sign up to have posts emailed to your inbox. Simple dimple! I haven’t made this in a couple years because mine never turned out very good– the bacteria in the air of where you make it gets incorporated into the taste and apparently my house doesn’t taste very good. My friend used to make amazing kombutcha– to get it really fizzy like the commercial kind you bottle it in small bottles (we used commercial kombutcha bottles we had saved up) and fill them maybe 3/4 full, put lids on. (This is after it’s done brewing). After a few more days the carbonation builds up in the bottle and it gets really fizzy. She sometimes made hers with flavored green tea or added a little bit of juice and it was really yummy. I had do idea that the bacteria in the air gets incorporated into the taste. Fascinating!! Maybe that is why the taste of each batch varies a bit? I’ve yet to add juice. 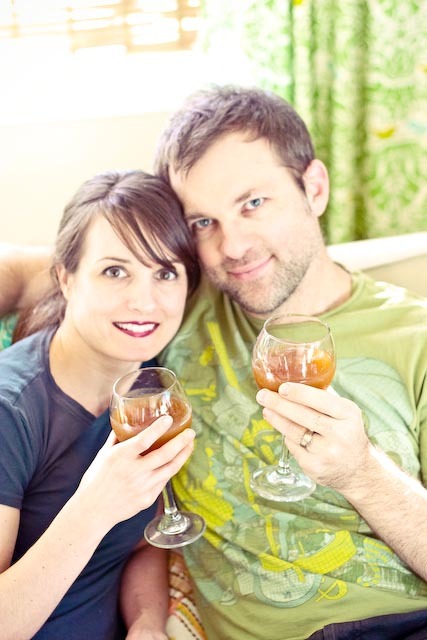 Someday I will do that because while I enjoy the kombucha I don’t “love” it. It’s pretty vinegary and I can’t really drink more than a few ounces at a time. You can use it in homemade salad dressing instead of vinegar or add a bunch of fruit (and some sugar if the fruit isn’t too sweet) to do the second “flavoring and fizzing” ferment and it may help. Or, just add it directly to a glass of juice instead. I don’t like it vinegary either! Very informative and it’s got me remembering having tried Kombucha years ago and liking it. Now I am on a mission to get a Scoby and get to brewing some of my own! Thanks for the reminder and helpful tips/info. Always enjoy reading your blogs. Thank you and good luck with your own brew! Let me know how it turns out! So THAT is why people love it. It’s brewed and fermented with sugar. I knew there was no way plain tea would make such a splash (pun intended). 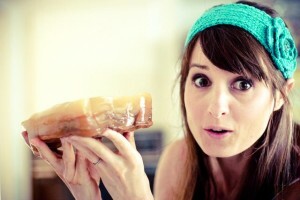 Surprisingly, there is not very much sugar in kombucha! The sugar is the food for the culture to consume. I’ve read there are only about 1-2 grams per 8 ounces assuming it has been allowed to ferment long enough. If it’s fermented 2 or more weeks it’s even less! (That has happened to me when I’ve forgotten about it. I gets sooo strong I have to throw it out.) That’s extremely low sugar content compared to other drinks like juice. 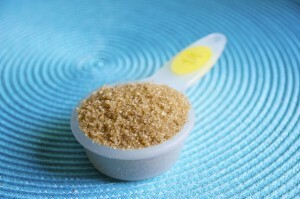 Maybe there is more sugar in commercial kombucha? I dunno. I haven’t really like commercial kombuchas I have tried b/c they taste like they are trying too hard to taste “good”. My kombucha tastes very much like apple cider vinegar with some carbonation. I can’t say I “love” it but drink it b/c of the health benefits and I’m always looking for ways to get more get more probiotics into my digestive tract without taking supplements! In the future, I would like to try to double ferment it with fruit juice to see if I can make it a little less vinegary but for now I enjoy it for what it is! Loved this post. I have tons of loose tea from teavana. Do you know if it’s possible to use that? I’m imagining all kinds of unique flavors. Mmmmm! I’m sure you can use loose tea but I think I remember reading something about using green or black tea. If you end up making it I’d love to hear how it turns out!